The RBSummerhouse has 7 SEASONS on HomeAway with all 5-STAR REVIEWS from our great guests!! You can find "RBSummerhouse" on your favorite social media sites. Please understand that I can't accommodate an inquiry through HomeAway to book at rates advertised on those sites. Thank you for helping me honor HomeAway's policies. The RBSummerhouse is a 4 Bedroom 3.5 Bath townhouse with a heated community pool in Canal Landing. I live in Washington, DC and rent my summer get-away for only a few weeks during the peak summer season. I hope you'll take the time to read the great reviews from my guests, many of whom come back year after year. My townhouse offers a peaceful, spacious, relaxing retreat for your Rehoboth Beach summer vacation. 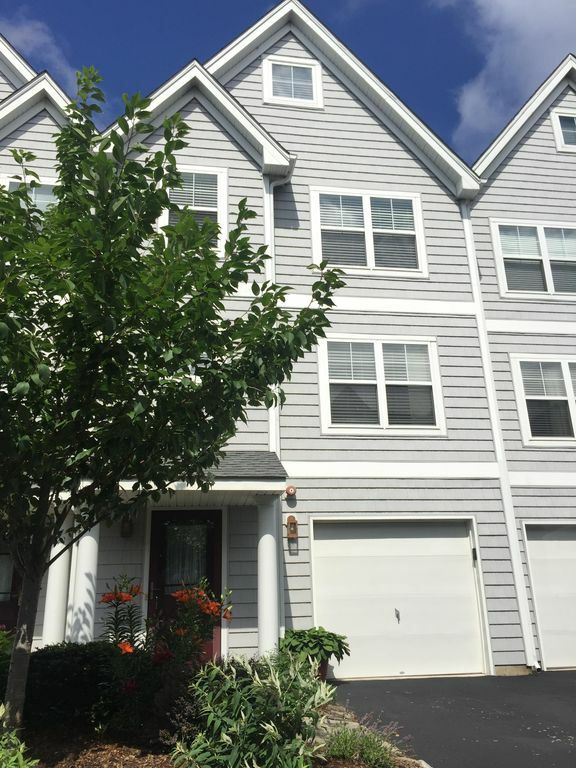 This four-level townhouse in the small, highly-desirable Canal Landing complex is perfect to enjoy everything the Rehoboth Beach area has to offer. Tucked along the canal right off Rehoboth Avenue and overlooking the small community pond with fountain, you'll appreciate this close but quiet, tranquil escape from all the beach town buzz. This location, east of Route 1, allows you a quick walk across the bridge into downtown within minutes for boutique browsing, fine dining, and beach bumming. Yet, you'll enjoy the easy, hassle-free car access to Rt. 1 on your way to Delaware's beautiful state park seashores, outlet shopping, movies, and amusements. Forget the traffic getting into or out of downtown Rehoboth Beach. This spot is the best of both worlds AND the best kept secret when it comes to close-in townhouses. Unlike other townhouse communities with units crowded around an asphalt parking lot, Canal Landing is a refreshing change of pace. Mature cherry trees grace the front of every townhouse. River birches, roses and blooming perennials throughout the community reflect the pride of this friendly community. The community pool is heated and open May through September (a rare amenity in the area). The community canal dock is perfect for fishing, docking a boat (by day only), and dropping a kayak to explore miles of the area’s creeks and canals. The community pond invites ducks, herons, and other bird. And, during the cool open-window nights of early or late summer, the sound of the pond’s fountain will put you to sleep. The townhouse has a garage, driveway and reserved parking space, accommodating parking for three vehicles. Secured wireless internet and digital cable, with a DVR, are provided. Located east of Rt. 1 just a couple blocks to downtown. Nicely upgraded and appointed: The townhouse is tastefully decorated and upgraded throughout. Kitchen extras include granite countertops, a deep-basin sink, undercabinet lighting, a smooth cooktop oven, a convection oven/microwave combo, and a side-by-side fridge with an ice and water dispenser. Beautiful hardwood floors and recessed lighting on the main living room and kitchen level set this townhouse apart. The fully equipped kitchen should meet all your cooking and entertainment needs. And for the barbeque enthusiast, we have a large, infrared-style gas grill. The living room entertainment center is equipped with HDTV with a DVR, surround sound, and in-ceiling speakers, with a Bluetooth audio adapter to wirelessly stream music from your own devices. Access the free, secure, private (non-shared) WiFi network throughout the townhouse. The loft and two master suites also have TVs. I keep a plenty of beach chairs, beach and pool toys, and a couple of bikes (and helmets) available for guests to use. Bed and bath linens are not provided. Spacious and comfortable layout: The townhouse is approximately 2800 sq. ft. The first floor has garage access, a washer and dryer, and a private master suite. The suite is equipped with a queen-size Sleep Number bed, large desk, bath with shower, large walk-in closet, HDTV and sliding glass doors to the patio with a direct view of the pond. The second floor contains a half bath, kitchen, dining and living area, which opens to a screened porch, overlooking the pond and perfect for dining alfresco. The third floor has a very spacious master suite, with a queen bed, cathedral ceiling, HDTV, walk-in closet, bath with double sinks and large shower. The suite opens out onto a top deck, perfect for sunbathing or stargazing. The third floor also has another smaller bedroom with a queen bed. Off the hallway is a common bathroom with a full size tub. Finally, the top floor is a large, private loft area, with a flexible space for use as a 4th bedroom, but also perfect for movie night or game time. The loft is furnished with a couch and chairs, a game table, and a queen bed. The loft has a flat panel TV with a DVD player and a sizeable DVD library. The Sussex County YMCA is just around the corner from the townhouse community. They have day, weekend and week-long passes and participate in the AWAY program. There are several other gyms in the Rehoboth area. My family has been coming to Rehoboth for 25 years. This was the best place we have stayed -- we love to ride our bikes once we get to Rehoboth with a goal of not getting in our cars for the entire week. This location was perfect for us. Lynn is such a great host also. I was so happy to receive a welcome text from her. We also had an engagement while we were there. My son and his girlfriend got engaged at the light house. So sweet. We will be back next year for year #26. Beautiful, very roomy, and has all the accommodations of home! Such a beautiful rental with so much room! All of the extras (bikes, beach chairs& umbrellas, kitchen “stuff,” etc) made it easy to relax and not worry about anything. We had such a wonderful week in this house. The house itself is beautifully decorated, very spacious and close to everything. The host was super attentive to our needs, we will definitely be back again! Awesome house! Lynn was very nice and responsive. Thank you. The house is absolutely beautiful! It is very spacious and comfortable. This was our first time staying at this house, and now it is the only place we want to stay. The house is large enough for everyone to have their own space, but cozy enough to always feel close to one another. Lynn goes out of her way to make you feel welcomed and genuinely wants you to enjoy your stay. It was clean and spacious and well equipped. We loved this property! It's a nice quiet neighborhood and the house itself was beautiful and well kept. The pool was a great way to beat the heat without having to go to the beach and it's heated so the water always feels nice. It's a bit of a walk to the beach, but is more manageable to bike. The beach chairs the owner keeps are great because they can be worn as backpacks and have large pockets to store things in. The kitchen is well stocked and is a nice size for cooking. -- During the peak summer season, weekly rentals are Saturday to Saturday. Check out at 10am. Check in at 3pm. -- Full payment is due at the time of booking, and refundable until 60 days prior to the check-in date (less a $250 cancellation charge).